Beware of judging others based on past experience. What is driving him or her—now? Where are you—now? Listen quietly for the deeper current. When we think “harmony” we tend to think “harmonious,” as in things blending in a pleasing way. “Harmony,” though, can be consonant or dissonant – it really speaks simply of relationship. 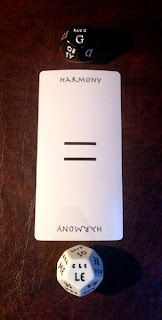 In this casting, the Harmony Card arises from the scalepoint of le, from unconscious or habitual response. The whole casting is in the key of G descending, indicating the Throat Chakra and issues of communication, of understanding and being understood. We are called, then, to examine our reactions and assumptions with regard to relationships: under what preconceived notions are we operating? We nod our heads knowingly, we think we’ve got their number; others do the same for us. What we’re really doing is swimming in our own stew. It is said we never cross the same stream twice; the landscape may look the same, but the water is ever changing. Our inner state at any given moment is a confluence of many streams – worry, joy, gratitude, frustration, calculation, obsession, pleasure, pain… and a lesser or greater degree of self-awareness, all flowing from the past into the ever advancing present. So it is with others. When we meet, we find ourselves in a bigger stream – not one that belongs to us, but to which we belong. What has brought us here? What is this place, so magically shifting beneath our feet? Harmonics – and by extension, harmonies – arise within every sound. The one becomes many. So are we together: separate, in relationship, and of the same. The Harmony Card reminds us to remember.